VII.16.14 Pompeii. Casa di Umbricius Scaurus (II) or House of Aulus Umbricius Scaurus, Father and Son (II). Steps to upper floor. Linked to VII.16.12, VII.16.13, VII.16.15, VII.16.16. We have only been able to locate a relatively small amount of published information on houses VII.16.12/13/14/15/16 and no comprehensive plan in a general textbook, though some partial plans have been published. The main source is Aoyagi M. and Pappalardo U. et al, 2006. 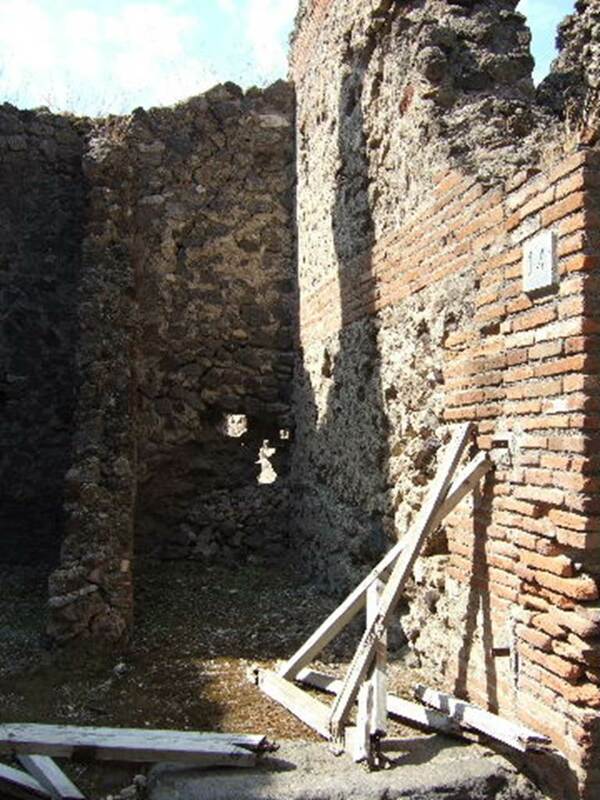 Pompei (Regiones VI-VII) Insula Occidentalis. Napoli: Valtrend. This is a specialised work and much more expensive than a generally available textbook. It does contain plans. We have generated two outline sketch plans based on that in Bragantini, de Vos, Badoni, 1986. Pitture e Pavimenti di Pompei, Parte 3. Rome: ICCD. This treats the five houses as two houses. 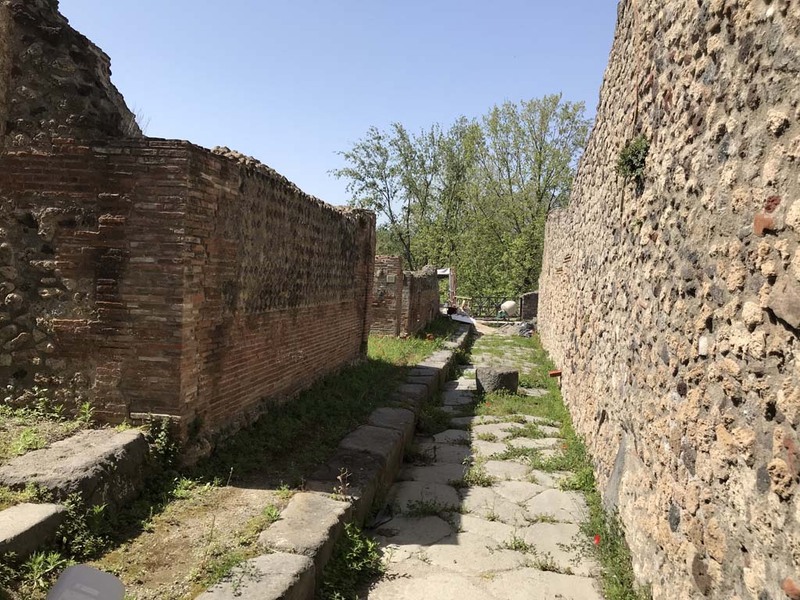 VII.16.15 and 16 are in the first house [Casa di Umbricius Scaurus (I)] with rooms numbered from 1 to 37. 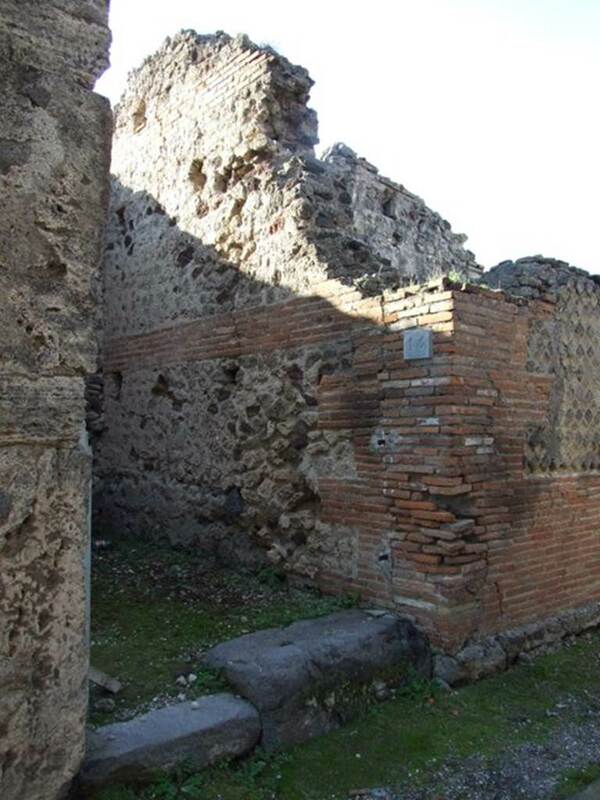 VII.16.12, 13 and 14 are in the second house [Casa di Umbricius Scaurus (II)] with rooms numbered from 1 to 50. We have devised two separate plans on these lines. The house and the remaining rooms are on two levels, a fact not obvious from some plans. However rooms 38 and 39 may be on a second lower level. We have indicated the room number under each photograph. The level is shown in the text under the first photograph for the room. 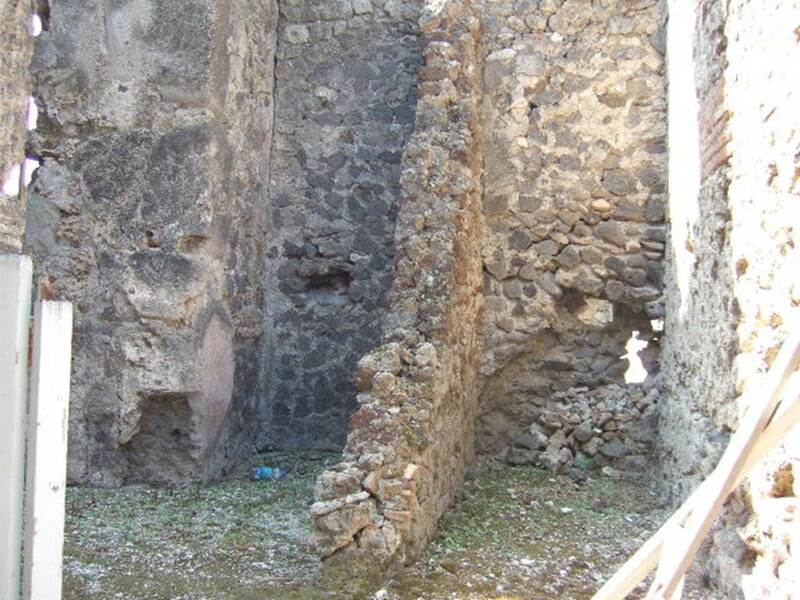 Some rooms have collapsed or the floors are dangerous so it was not possible to visit all parts to verify the plan. These houses were damaged by bombing on 13th September 1943. They are in a derelict and dangerous state and are not open to the public. Restoration work has been in progress in 2010 and 2011 on some parts of the houses. Please be aware that existing plans, including ours, may not correspond exactly to what is on the ground, and also may not correspond to the aerial image on Google Earth. VII.16.14 Pompeii. December 2007. Steps to upper floor. VII.16.14 Pompeii. September 2005. Doorway leading to room 4, steps to upper floor. VII.16.14 Pompeii. September 2005. Room 4, steps to upper floor, on right. Doorway to room 3, on the left. VII.16.14 Pompeii. December 2007. Room 4, steps to upper floor, on right. Doorway to room 3 in VII.16.13, on the left.